Laos is the current darling of Southeast Asia and it’s not hard to figure out why. Sure the scenery is stunning, thick tropical jungle and fast-flowing rivers, and there’s certainly plenty of culture in this temple-dotted land, but what really makes the country stand out is its people. 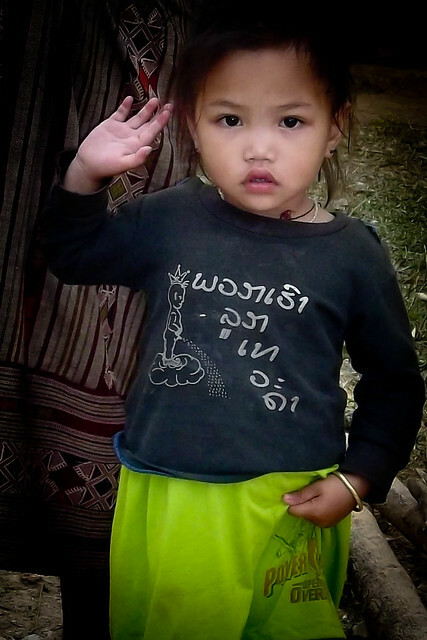 The Lao people are friendly and warm and surely among the most gentle on the planet. And for cyclists, they’re always ready with a big smile and an enthusiastic SAWAIDEE!!!!! Hope you enjoy the photos, I know we had a wonderful time meeting so many interesting people while cycling the highlands of northern Laos. 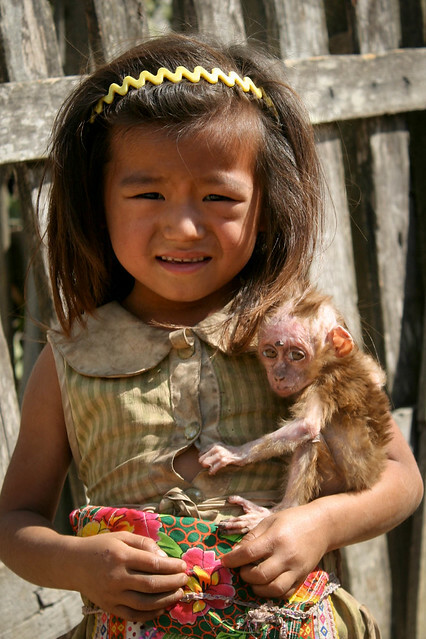 We came across this little girl and her pet monkey early one morning cycling through the highlands. The baby is in pretty rough condition, probably diseased and unlikely to live long. Any guesses on what happened to mama monkey? 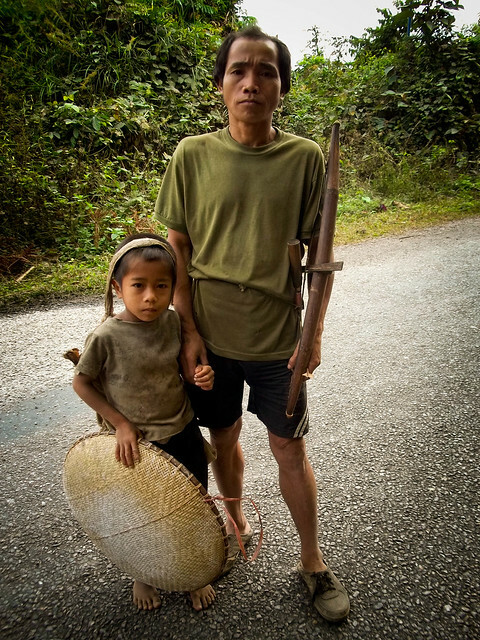 This father and son were off to the forest to catch some dinner. Hill tribe people in Laos still hunt using very traditional methods, as you can see from the photo. Women spend their days looking after children, cooking, working in the fields, weaving and making baskets. Even toddlers manage a wave and a greeting as we pass. While many girls are stuck tending younger siblings or helping out in the home, these girls were just having fun being kids. 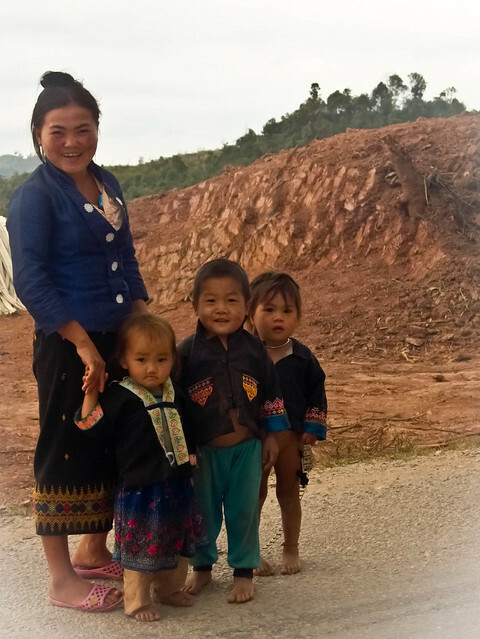 Toys are almost non-existent in the highlands, but resourceful Hmong children have no problem keeping themselves amused. 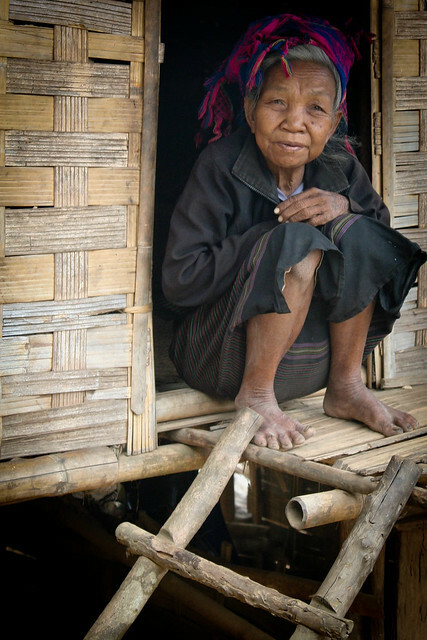 This woman watches the world go by as she crouches in the doorway of her thatched home on stilts in the Laos highlands. 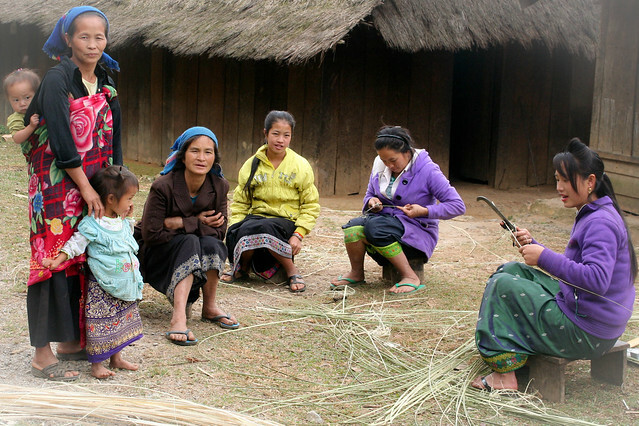 In large Hmong families, it’s up to the older girls to look after the younger children. 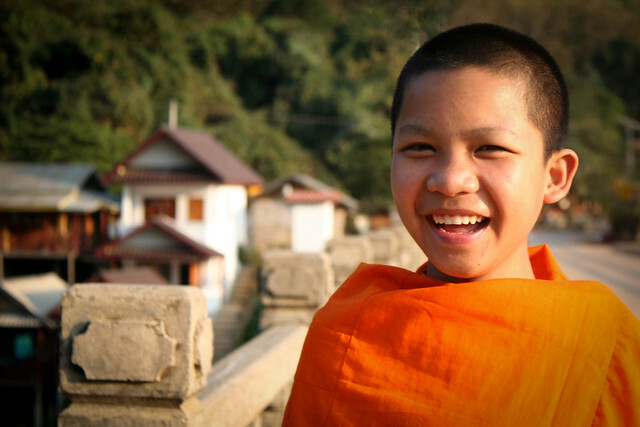 Novice monks are young boys who temporarily commit to monkhood, shaving their heads and donning the orange robe. 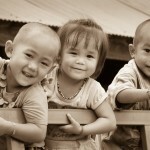 All Lao boys are expected to become novice monks for at least three months of their lives. Many of the boys come to bigger towns with temples from poor farming villages without adequate schools. Many older people chew betelnut, a mild narcotic. This woman’s teeth are stained a brilliant red from years and years of use. This woman was working hard in the fields with her baby slung on her back. 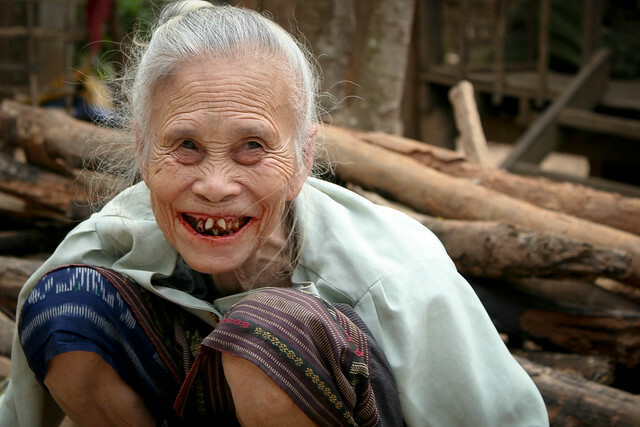 Dental care is obviously not widely available in the highlands of Laos. 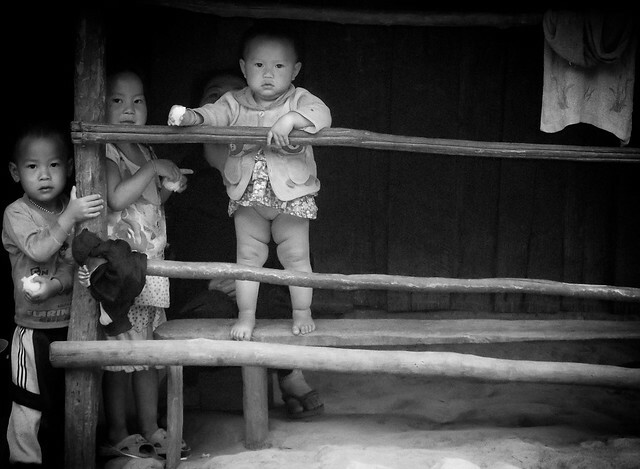 Kids are everywhere as we ride through villages in northern Laos. Older ones laugh and smile, but younger ones often just stare in wonder. 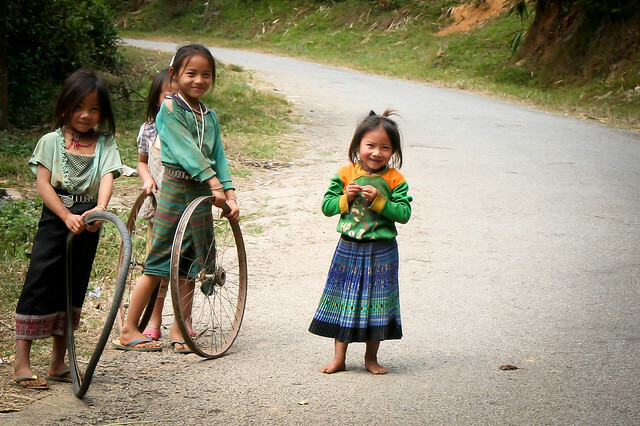 The humble bicycle is well-loved in Laos. 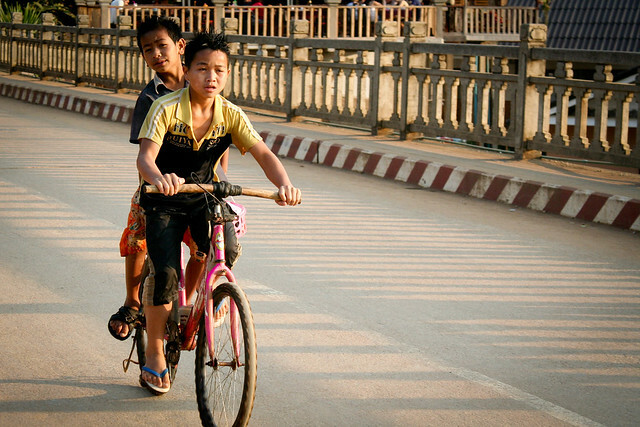 These boys were flying across the bridge over the Nam Ou River in Nong Khiaw just as the sun was getting low in the sky. 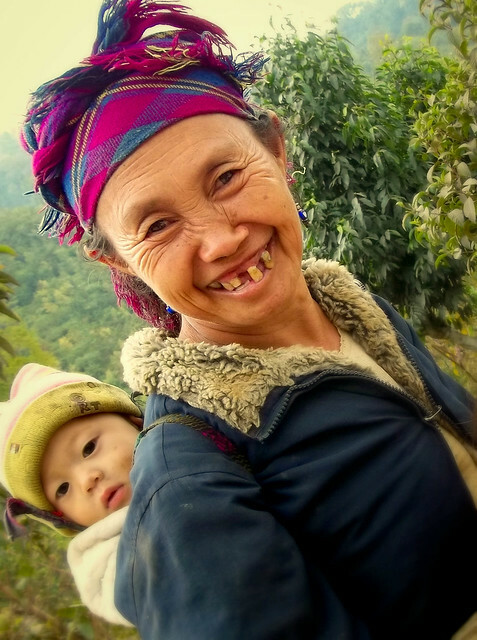 You can check out more of our Photos of Laos on Flickr. Leave a comment and let us know what you’re thinking. Or send us an email at worldbiking@gmail.com. Great photos Amaya… I’d especially would like to know what the little boy’s shirt says in #5. Thanks for sharing as always! #5 is a mystery to me..glad you enjoyed the photos and hope all is well in Guatemala…you guys sure were fast. Don’t you think Laos is the Africa of Asia? Yes, many parts of Laos are surprisingly similar to Africa. In particular the exuberant kids. And the poverty, of course. I’m really shocked to see basic sanitation lacking in some villages and to see kids obviously malnourished. Actually, #5 says “puag rao loog tewada”, lit. “we are angel’s children”, as in “we’re so spoiled, we can’t be punished, treat us like treasures”, along those lines. You’d say something like “you’re such an angel’s child” if you were berating a child for being so pampered and immune to punishment. Also, the word is “sa-bai-dee”, which is literally “feeling good”. Thai greeting is “sa what dee”, and Cambodian is “sa was sa dai”. Basic utilities are lacking in most parts of Laos, so water comes from natural sources, and electricity (if any) comes from generators, diesel or water-powered.